There are many reasons to dislike Target‘s American Girl knockoffs. This, however, may be the last straw. You know how when you go someplace like Target there’s always a kid having a temper-tantrum in the toy aisle? Like, full-on screaming, on the ground, kicking, bodily fluids flying everywhere as they thrash around? That’s how I feel inside my head, looking at this! I love you all. I appreciate every submission (and want more! MORE!). But sometimes I get submissions I choose not to use, because I don’t like them. It’s my blog. Sometimes I feel like the mistake was so obviously made by someone struggling with English that I don’t find it amusing… I’ve made hideous errors myself in foreign languages. More than once! Sometimes I don’t think the “mistake” was a mistake. Sometimes I’m just in a bad mood and I don’t want to, jeez. And then sometimes I find myself genuinely puzzled about the error. I stare at it. I try to think about what the submitter could have seen that I’m not seeing. I try to be ONE with the error. This picture wasn’t quite one of those. Veronica wrote only “Gag” in her email, so I wasn’t sure what I was looking for. It’s clearly a tagline, and I know copywriters have a bit of creative latitude in things like capitalization and punctuation. So I looked at this one, and contemplated whether it was really a mistake. and I just can’t handle it any more. What is this, Volvo? What are you trying to do to us? I’m so confused. As Reporter #1 notes, we’ve had several posts from Tops Friendly Markets recently. They’re not quite MARTA, but we thank them nonetheless. ANYWAY, she found this cutie in an email flyer and sent it right along. Reporter #1 wonders “What is a Tasting Shrimp?” I actually read it slightly differently and wondered what a new-tasting shrimp would taste like. Then I got a little nauseous. Okay, so Kacia’s only in medical school, but she’s still totally qualified to point out how excellent this advice is. I think it’s also probably a good idea to warn people before posting pictures of fences like this, because my personal eyeballs want to explode from the pattern. But hey, I will suffer through it to provide this valuable service. 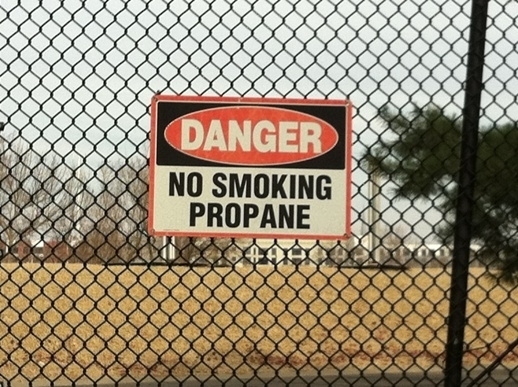 Smoking propane is dangerous, kids. Just say no. 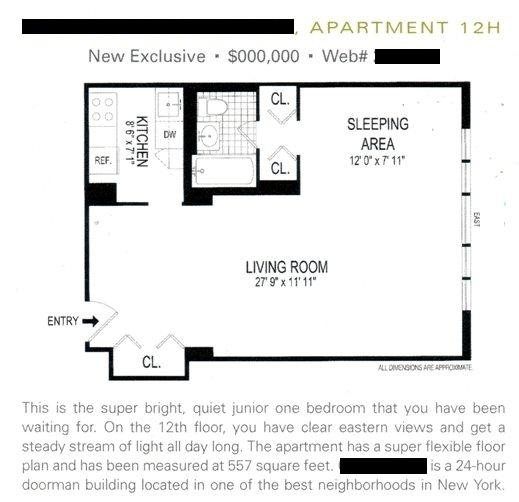 Free apartments! In New York! I have it in writing! It’s actually Meg who has this in writing, as it appeared in her mailbox. I’ve taken the liberty of cropping the heck out of the postcard and sprinkling some black boxes around because Meg actually lives here. Isn’t that always the way, Meg? You pay real money for something and THEN there’s a big sale. Grr. 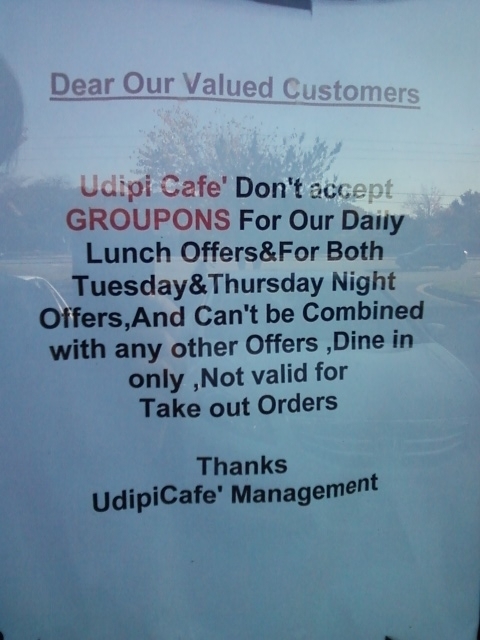 I’m so busy trying to parse when I could use a Groupon that I barely even notice the totally random capitalization, spacing, punctuation, etc. First, observe the ridiculous punctuation. Now let’s let Kacia explain why this is extra-silly. [This is a] warning sticker pasted onto the bottom of a can of mock abalone from our local Asian grocery. Note that the entire ingredient list printed on the can is ‘Fried gluten (wheat, soy bean oil), salt, sugar, soy sauce (soy bean, wheat, water, salt), soy bean oil.’ Yet somehow from that we hopeless consumers would be unable to determine that this product contains wheat and soybeans. 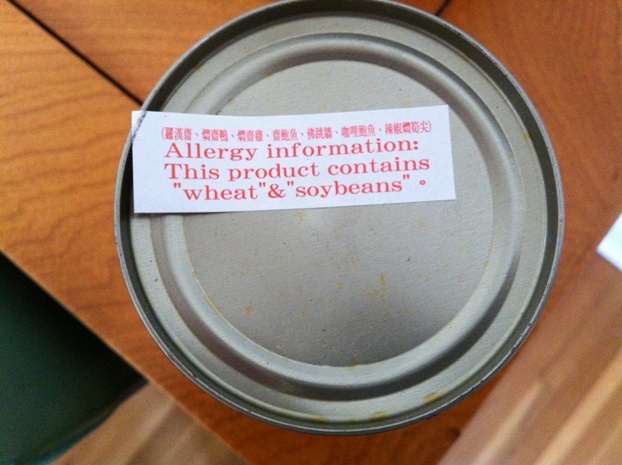 Unless… “wheat” and “soybeans” is warning us of additional ingredients so unmentionable that we must employ euphemisms rather than speak of them! Horrors! The end is the beginning is the end. I… don’t even know where to start with this. Aw, come on, Reporter #1! We can do this. Let’s see. That’s a bizarre, if not ungrammatical, choice of preposition, for one thing. 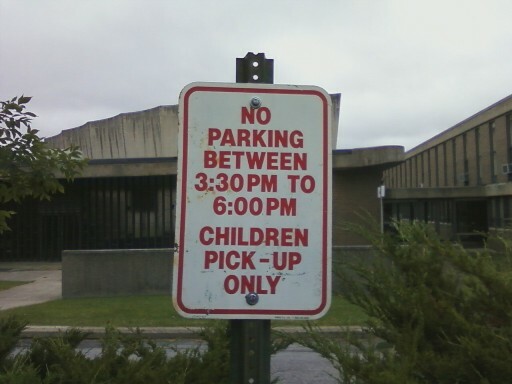 And I kind of feel like “Children pick-up only” would feel less like an instruction being given to children if they’d gone with… something else. Yeah, this sign just creeps me out too. So, I get a bazillion emails a day at four different addresses. I know you, dear readers, will therefore not hold it against me when I tell you that I’ve missed some submissions. They were little treats in my in-box as I cleaned it out! I do apologize. I will reshuffle the posting schedule and put the long-lost old stuff up in priority positions. My instincts are honed razor-sharp. I can spot a misused quotation mark at great distances. So I sidled over to take a picture of this sign. Are they making a joke about lowing, which is a sound cows make? 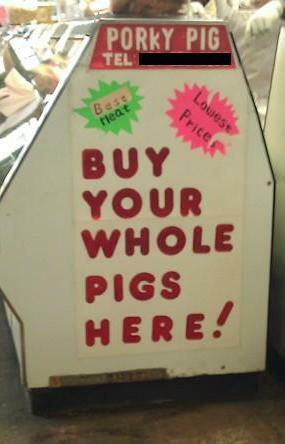 Because this is pork, which makes that joke kind of a stretch. 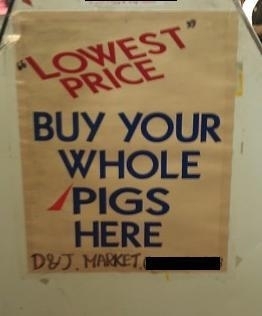 Anyway, I was enjoying this sign when I noticed that by turning around, without moving a step in any direction, I could see this sign on a competitor’s booth. So clearly we have an additional problem: one of these signs is FALSE.